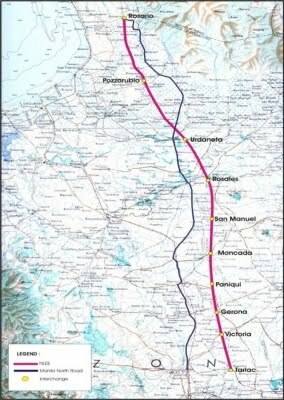 For years we've been hearing about planned construction of roads and rail lines and other means to effect faster travel in the Philippines but turned out to be mere "drawings" like for example that uber-expensive and corruption-ridden NorthRail (another "legacy" of the "great" Gloria Macapagal-Arroyo) and super-delayed SLEx-NLEx road connectors (SMC-led Skyway and MVP-led PNR tracks) and the that was recently approved but will have to wait for 2016 the soonest. As of the moment we still can't find the definitive TPLEx map but thrice Tutubi found road construction near the end of SCTEx and a flyover near the Tarlac -Cabanatuan Road (an detour Tutubi loves to take just to avoid traffic of Tarlac and pass by Victoria, Paniqui and Pura towns). 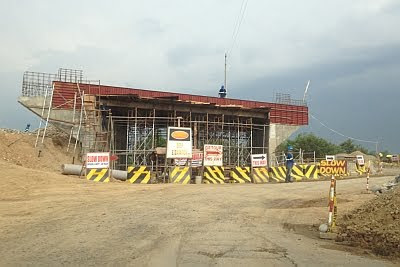 Here's a picture of a flyover construction taken about three months ago that will give you hope that TPLEx is really being constructed and not another grand "drawing"
Phase II will be widening to 4 lanes when Phase I capacity reaches 25,000 vehicles per day"
Imagine the reduction of travel time from Manila to Baguio from 6 hours to about 3.5 hours as you don't have to pass by the traffic-prone and tricycle-laden MacArthur Highway. Ilocos Region is also possible to be driven by Tutubi when this opens to the public. Will update this post then Tutubi gets hold of a TPLEx map and probably TPLEx toll fees and rates, toll gates and exits once finished. TARGET COMPLETION of TPLEx Phase 1 in in May 2013.